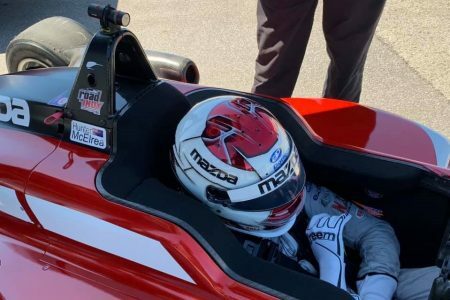 Last year’s Australian Formula Ford series winner, Hunter McElrea, has qualified on the front row for the first race of the 2019 USF2000 Championship in St Petersburg. The New Zealander, who earned his place in the field by winning the Mazda Road To Indy Shootout last December, ended up 0.1227s off pole in the 21-car field and was the first of four Pabst Racing entries. “It was good, heaps of fun out there getting close to the walls and just getting more and more comfortable with it,” said McElrea. “The Pabst car is really quick and it’s really, really fun, so I can’t wait for Qualifying 2 tomorrow and see how we go,” said McElrea. Australian Cameron Shields ended up 18th after losing his best lap for causing a red flag. Braden Eves was fastest with a lap time of 1:13.5277s. There will be another qualifying session to set the grid for Race 2 before the races take place on Friday and Saturday (local time).